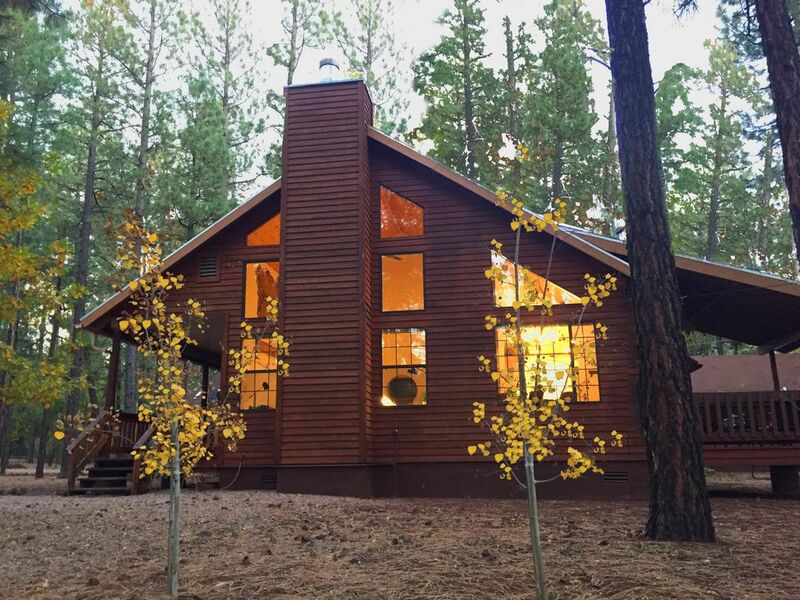 The world’s largest stand of Ponderosa pines is yours to enjoy from the comfort of secluded cabin in Pinetop-Lakeside. Located on a large wooded lot at the end of a secluded cul-de-sac, you will enjoy the mid-century modern design inside and outdoor privacy. Gather the family around the floor to ceiling gas fireplace or share it with the special someone. Our family’s “Ponderosa” cabin is fully equipped so you can make the most of your stay in this charming mountain town. It is situated near the Pinetop Country Club and surrounded by the Apache-Sitgreaves National Forest. This region is beloved by skiers, hikers, wildlife lovers, and people who enjoy all four seasons. Take a stroll along a lakeshore, plan an adventure, or just get cozy at the cabin and relax. The choice is yours. The first thing you notice about this Pinetop cabin is the great room featuring beautiful hardwood floors and a tongue & groove ceiling. Natural daylight streams in. The master suite is equipped with a luxurious king-sized bed with master bath and roomy his and her sinks. A second bedroom with a queen-sized bed is conveniently located across from a guest bath. Just pack your toothbrush and toothpaste because the bedding, linens, towels, and bath supplies (shampoo, conditioner, body soap, paper, hair dryers, etc.) are all provided. A washer and dryer are also on the premises for extended stays. Great times include great meals. If you’re dining in, the kitchen is where the socializing begins. Gather around the large counter to prepare your fixin’s, tend bar or serve meals. All the essentials are provided; a refrigerator and icemaker, an electric stove, a microwave, blender, and a crockpot are here for you. The cabinets are stocked with cookware, glasses and eating utensils. When it’s time to clean up, the dishwasher makes life easier. For family-style meals, there is a formal dining area just steps from the kitchen and a picnic table outside. Want to breathe it all in? Just meander outside and enjoy the surroundings from the spacious covered porch. With a coffee in hand, it’s the ideal place to enjoy a summer monsoon, a light sprinkling of snow, or a bountiful sky full of stars. If pine trees make you yearn for a campfire, just follow the path to the outdoor fire ring. In no time at all, you’ll be charring up some marshmallows for a batch of s’mores. A gas barbeque is also available for grilling. Do you want to dine out? Check out the local restaurant options over our high-speed Wi-Fi. Do you have some clubs in the trunk? Set a tee time for one of the six public golf courses and three private ones in the area. You can check out the local trails, visit the nearby Hon-Dah Casino, or plan an adventure to the Sunrise Ski Park just 25 minutes away where you can ride a zip-line or take the chair lift to new heights in summer and in winter the same slopes are great for family friendly skiing, snowboarding, or taking a sleigh ride. We hope you’ll love the Ponderosa cabin as much as we do. This is our second home and we want to share this incredible experience with responsible renters with a light touch and joyful spirit. We make it easy for you. When you arrive, there’s generous parking and a keyless entry for a hassle-free welcome. No further check in is needed. Washer & Dryer (indoor laundry room) with detergent, bleach and dryer sheets. Garage can be made available during winter storms and for Car Show participants. Check with owner. Electric oven and stove top. Drip coffee maker with provided filters. Bring your favorite grind! Basic spices and cooking supplies. New dishes and dining utensils throughout. Modern pots, pans and cooking utensils. Fully stocked kitchen with granite counter tops. Includes blender, and all supplies necessary to prepare your meals. Midcentury Modern dining set with leather chair. Two additional bar stools at the the breakfast bar. Large HD-LED flat screen, Smart TV, Wifi enabled for guests subscription services (such as Netflix). Kayak and boat rentals are available for nearby lakes, details in our guest guide. Covered decks in front and back. The front deck extends the length of the house with glider and table and chairs for coffee or dining. Back deck with padded chairs, couch and table. 25 miles from Sunrise Ski Resort, Arizona's largest ski area. Includes summer chair lift rides, zip-lines and children's play area. Cozy place with a great view of the woods. Really enjoyed our stay here. The cabin is well equipped. It has a nice view of the woods, yet it is still close to town. Information provided on local attractions/restaurants was helpful. Andy was very accommodating. Will likely stay here again. Our family of four spent a wonderful weekend in this extremely well-equipped and comfortable home. It is beautifully decorated and so well-organized. We definitely plan to return. We stayed at the Lil Ponderosa in January for a ski weekend. The cabin is clean, decor is on point, and the owners have a knack for hospitality. Anything we could have wanted was right there! We especially appreciated the beautiful bedding, so cozy; and the coffee set up was great! This beautifully decorated, warm and comfortable cabin exceeded all of our expectations. The perfect size for a small family, it’s private and quiet in a cul-de-sac with lots of space to run and play. The kitchen was fully stocked, the TV easy to work, the beds beyond amazing, the bathrooms well stocked with towels and then the little things like menus and maps available for reference and wine on the counter. Thank you, Andy, for your excellent communication before, during and after our stay, too! We would love to return! This cabin was gorgeous! It looked like Chip and Joanna Gains from HGTV had just finished remodeling it. The furnishings, the linens and decorations were absolutly beautiful. Plus everything you would ever want was inside this cabin! Dishes, pots and pans, measuring cups, strainer, cutting boards even a waffle maker was stocked in this kitchen. The other details like games, puzzles, books as well as soaps, blankets, etc. were all there. Not a single item missed. One of the nicest properties I have ever stayed at! I travel for work and wish everywhere I went was like this! I put this VRBO in my Ritz Carlton and Westin category! Thank you for the wonderful review! We truly hope everyone has the experience you describe. Please stay with us for your next visit to the White Mountains! We had another great experience at the cabin. Cabin was perfect and the 12" of snow was fun!